I love John Piper’s passion and pastoral heart. I love the theological influence he has had on my generation so when I come across an article like this one I just scratch my head. I think Piper is out of touch here. For the reader’s sake I want to make two simple comments regarding Piper’s article. The Title… really? : Piper entitled his article How SHOULD Christians Think About Socialism. Really? He says in his article “In other words, Socialism borrows the compassionate aims of Christianity in meeting people’s needs while rejecting the Christian expectation that this compassion not be coerced or forced.” In other portions of the article he paints the with a very broad brush that a Bernie Sanders socialism that takes away our freedoms. Hmm well the pushy title of John’s article seems to take away my freedom (or at least doesn’t acknowledge it). I feel coerced and forced by it. Whats wrong with the title How CAN Christians Think About Socialism, or What I Think About Socialism. Why is John so prescriptive here? I have a feeling many Christians would consider Democratic Socialism to be a reasonable political platform. According to Politico almost half of america would vote socialist. So why imply that I am running the risk of not thinking “Christian” if I don’t agree with your slapdash and uninformed opinion on this issue? The title of his article seems to imply that he has “ownership” of who’s in and who’s out. Maybe this whole socialism thing is a Gospel issue to Piper? Hmm sounds like socialist thinking to me… hmmm… removing the freedom to think freely in order to control? At least by his definition. As a gatekeeper of a particular brand of conservative Christianity Piper seems to think freedom is a good thing as long as you use it to agree with his particular interpretation of the Bible as it relates to this particular cultural issue. I cant go too far with my broad brush strokes against American political Christian conservatism though. It seems they are becoming more diversified. Liberty University recently allowed Bernie Sanders to come and speak at their school. I was very blessed to see them do this. Here is his speech. 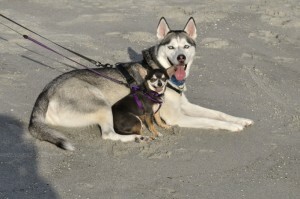 Mistaking a Husky for a Chihuahua: Throughout the article Piper seems to mistake centralized socialism or Marx’s socialist mode of production for Democratic Socialism which is like mistaking a Husky for a Chihuahua or an Eagle for a Seagull. Countries like Norway, Sweden, Finland, Denmark, Germany, Netherlands, UK, Japan and Canada have all used and profited well from some form of Democratic Socialism. I agree with Josh Barro who calls Bernie Sanders a “Democratic Socialist Capitalist” in his article “Bernie Sanders, Democratic Socialist Capitalist”. I would go one step further and call Bernie Sanders an American Democratic Socialist Capitalist. Democratic socialism (Sanders is running as a democrat) with an american twist would be a wonderful third way for a country like ours to diversify democratically. Currently we only have two real options I would love to have three or four strong competing platforms. I would consider myself a theologically conservative evangelical Christian. I affirm the authority of scripture. I affirm the apostles creed. I believe Jesus really lived, is the Son of God, He really died. He really rose from the dead and is coming again to make heaven and earth one. Im not sure the impending “heaven and earth becoming one”, “Lord of Heaven and earth”, King Jesus” government stuff is going to be a democratic exercise in individual freedom does John Piper? Bernie Sanders among other presidential candidates really has my attention and I see no great ethical conflict between the ethos of his political platform and my faith. Or maybe I should just say I don’t share Piper’s opinion. 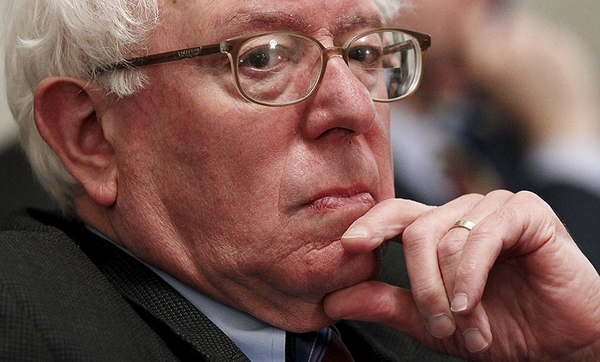 I agree that America right now is way off track and needs this “revolution” Bernie likes to babble about, but I just don’t understand how Christians can support this democratic socialist who is sprinting away from personal accountability, freedom, and the original intentions for our country that the Constitution was designed with. Just read Genesis. Freedom was so important to God. God gave people the decision to choose good or evil (and Adam and Eve faltered). But God’s glory is seen in people having the ability to love Him freely and accept redemption freely. If God decided everyone would live their lives a certain way (as in if it were impossible for Adam to eat the fruit in the beginning), then there would be a perfect society of enslaved mindless drones. But He saw no beauty in that. If the government in any way is forcing individuals to help other people, then those people are losing freedoms, and that act of giving or loving is meaningless! God Himself didn’t encourage this! He knew the value and power to love that freedom gives. And the government has infinitely LESS power than God to make people act rightly anyway. Although abundant generosity by people, whether rich or poor, is obviously the ideal standard, enforcing it is frankly an enforcement of a moral/spiritual belief by the federal government and in violation of separation of church and state. It’s not the goverment’s job to force people to do the right thing (such as help the poor, or help the sick). We are not entitled to some minimum standard of living just because we are in the United States! The government is just to ensure it’s citizens basic rights, and provide justice when one individual infringes upon that of another. But beyond that, it’s the people’s decision! “I will choose to give because I know God and I want you to know Him so you can share in the joy that I have found!” This is the appropriate response. Not “Hey rich 1%, you help this poor man!” or “Hey Doctor! You treat this man!” as Bernie would say. Yes a dialogue should be opened with those people as well, but it should revolve around Christ and the change he can cause in selfish hearts. John Piper spoke with clarity and wisdom on this issue in his article, even though it’s become such an unpopular opinion. Young Christians have recently come to rebel against wisdom like teenagers rebelling against the wisdom of a parent. Just because a lot of people have believed in something for years doesn’t make it right, but IT ALSO DOESN’T MAKE IT WRONG. Democratic Socialism engenders ideals that undermine personal liberties, and that’s the bottom line. It doesn’t matter that other countries do it; it doesn’t matter that it’s not “full-blown socialism.” It’s a step in the wrong direction philosophically in addition to the disastrous repercussions it would bring economically here in the US. Just stop and think it through. Hope that at least gave some clarity as to why the other side thinks the way it does, and I mean this constructively as part of a discussion. I hope that you will think about what I have written for a while with an open mind before you respond and really weigh it rather than impulsively kick back. Ultimately I think Bernie means well morally (even though he is not based in any faith), but think past the great things he talks about like “free tuition,” “wealth distibution,” etc. to what is physically happening for those things to come to fruition. Who is losing, who is gaining, who is getting what they deserve? On a theological tone, one of the mistakes, Christians especially here in the west make, is that we hold onto the bifurcation of personal vs corporate. We even read it into scriptures. Yet scriptures makes no such assumptions. Max you said… “I just don’t understand how Christians can support this democratic socialist” Well I am assuming you are a Christian. Do you support or have you benefited from any of these products of democratic socialism? Well here is democratic socialism at work in America already. Shut off fox news my friend. Like I said in my first sentence, I agree that in the US we’ve gotten way off track. Yes I’ve benefited from some of those programs but that doesn’t mean they are efficient or the best approach to handling the task that each program does. The length of that list and the mountain of national debt only supports my point in how flawed those inefficient systems are, in addition to the fact that they each have reduced personal accountability in some small degree. Don’t get caught up in the details, just consider the principles. And I was hoping you would take more time to reflect upon what I said at first. Please refrain from personal attacks such as your “fox news” remark which add nothing to the discussion and instead allow avoidance of the presentation of logical arguments. “Thought shalt not steal” seems to imply that things can belong to one person or another. Max I completely disagree with you. You have made your argument that basically God doesn’t agree with a form party platform of Government called Democratic Socialism. I disagree with your interpretation of Jesus, Scripture, and Democratic Socialism. I think you are massively overreacting. At the end of the day there is no way for me to use logic with a person that is idealizing neutral government concepts in the name of logic. Like a gun, butterknife or even capitalism socialism can be used for bad and good. What am I misinterpreting about each of those things (Jesus, Scripture, Democratic Socialism)? The only thing I don’t understand (which i would be glad to hear an explanation of) is how they can all happily coincide under our constitution. Sanders, a self -proclaimed Democratic socialist lauds raising taxes on the wealthy to help the lesser, raising minimum wage, providing free tuition for all and I trust that he understands democratic socialism, and that those platforms fall under it (do I misunderstand this?). This is exactly coercing people into helping others, which God has never done. He works through the heart by free will, he changes people internally (do I misunderstand this?). Explain to me where you find entitlement to some minimum standard of living in Scripture. Show me a time when Jesus took from the hand of a wealthy person and gave it to the poor against their will. Show me any counterargument, I only want to understand. The bottom line is a good government cannot compensate for a flawed population, and democratic socialism is an attempt to treat the symptoms rather than the cause (heart), and is therefore destined for failure. Even if you do believe that, not everyone in the US believes in God, and using that principle to justify your political stances is violating religious freedom. Besides, God doesn’t want us to take some of His things from one person and give them to another against their will anyway (Thou shalt not steal). Also, your statement: “God doesn’t agree with a form party platform of Government called Democratic Socialism.” I am not arguing to argue against democratic socialism. I am just trying to hold this ideology up to scripture and see if it aligns in any way, which I don’t believe it does. Further, I don’t even believe it aligns with the Constitution like I said above. Max to a constitution loving Christian American the government of Jesus is going to seem pretty oppressive and unfair. That’s what I’m trying to get at. There will be no “private property” in the coming kingdom. It will all belong to King Jesus. We are also told to pay taxes. This seems to imply that even though something might in our possession, it still belongs to some corporate body. Of course in the end everything belongs to God. Sometimes the idea of personal property can be taken to an extreme where it comes close to denying the existence of God. As Christians we should not go there. We need to acknowledge that nothing we have is our own. “To a Constitution loving, Christian American.” I never thought I would see a day when a fellow Christian used this phrase as a negative. Jesus doesn’t ever lay out some strategy for the perfect government that I know of. He just gives us principles to live by to show our love for God after coming to Him. And yes, Jesus has been unfair. He gave us something we NEVER came close to deserving. Our government though, is based on morals and basic rights that people decided years ago, and they happen to be largely shared with Christianity, but it is by no means a “Biblical” government. And Samuel points out a BIG and DANGEROUS flaw in thinking of the American population (including Christian Sanders supporters). Do not confuse God and government. Even if you believe God owns everything, this point is unrelated to corporate or governmental ownership. We the People created the system of government, and it only owns what we individuals give it, not the other way around. We do not have to continue to create and support it when it does not follow our design any more. That God owns everything is very much related to corporate ownership! To make corporate ownership look bad, you have to resort to a view of personal ownership which is not Christian. Most people who think that somehow socialism goes against Christian beliefs have a skewed view of personal ownership. The best Biblical way, to refute this erroneous view of personal ownership, is to acknowledge that God owns everything. This is exactly what Jesus does when questioned about taxes. If you want to oppose democratic socialism, i am fine with it. It is when people assume somehow socialism is morally inferior or it is incompatible with the Bible, that the problem arises. Such Christians have adopted worldly values as Christian values. I believe that you have a skewed view of what it means for God to own everything. God can own everything (in that He created it), and individuals can also own some of those things. Multiple ownership is possible. But it is a non-sequitor to say that the idea everything belongs to God means that everything belongs to everyone. Very separate ideas. We are not God. So your body does not belong to me, your time does not belong to me, etc (and even moreso for non-christians). Corporate ownership undermines personal responsibility and de-incentivizes hard work because the harder you work, the less the slacker has to. Don’t you see, that WE are the slackers in this scenario, and Jesus CHOSE to FREELY give us a gift we didn’t deserve! He set the example that has changed the world forever. He did not come because we forced Him. He came because He loved us, and that has made the entire difference in why Christianity is so different. That is grace. Has no meaning, has no power, if it is earned or coerced. Not everything is relative, God provides absolute truth, and I just urge you to further consider whether how you live and how you demand that others live (through government) compares to the examples that God has provided. In my opinion, Democratic Socialism just doesn’t hold water. It aims for a change in works (redistribution, forcing individuals to do the selfless thing) without a change of heart (as it will apply to Christian and non-Christian alike).